If your Jeep isn't equipped with production fog lamps, it's always a good idea to add them yourself. At JustforJeeps.com, our Mopar production fog lamp kit includes everything you need to improve low-visibility driving conditions and cut through dense fog. 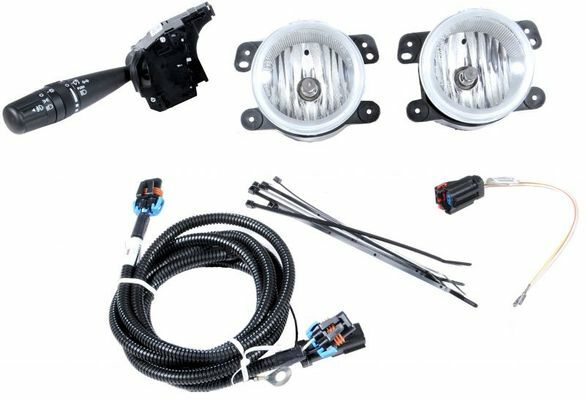 They're designed especially for use on Mopar off-road and tubular front bumpers that allow integrated fog lamps. These fog lights must be activated by a Jeep dealership. Fog Lights must be activated by a Jeep Dealership. Excellent Product At A Wonderful Price! This product is exactly as described, easy to install, and at quite a bit cheaper price than you will find many other places!